Full Spectrum Infrared Sauna, the Next Generation? Is a full spectrum infrared sauna the wave of the future? Marketing guys are, well, marketing guys. You know what I mean - they're liable to say or do almost anything in order to convince consumers to buy whatever products they're motivated to sell that day. And, unfortunately, the people who market infrared saunas aren't necessarily any different. For example, in times past, a savvy infrared sauna company's marketers and salespeople would (of course) play up the benefits of the type of infrared sauna heaters their particular saunas used. They would then use those benefits to try to convince potential buyers that the saunas they were selling were a large cut above those of their competitors. It was a convenient strategy to adopt, and it often worked. For example, if the infrared saunas these companies and their marketers and salespeople were trying to sell came equipped with far infrared heaters, their promotional flyers, advertisements and sales pitches would be sure to emphasize the exceptional nature of far infrared as compared to its near infrared sibling. Naturally, the opposite was also true. Companies selling infrared sauna cabins that were equipped with near infrared heaters used promotional flyers and other marketing materials to loudly proclaim that their infrared saunas, when compared to those that used far infrared sauna heaters, were vastly superior. In other words, marketers were "twisting" the advantages of both types of infrared sauna heaters to suit their own purposes - to sell the particular type of infrared sauna cabins their companies carried. By the way, if you're not sure what far infrared and near infrared are, how they differ and what all the fuss is about, there's a separate article about Wien's law and the infrared spectrum on our site that can help clear up any confusion. Followers of checkinfrared.com will know that I've always believed - and said - that near infrared and far infrared are both beneficial, with both types of infrared energy providing therapeutic effects. I believe the type of infrared heater that would be best for the infrared sauna unit you decide to buy is mainly a matter of personal preference. Once you decide which type of infrared you prefer (far or near), that information will then help you select a specific infrared sauna. 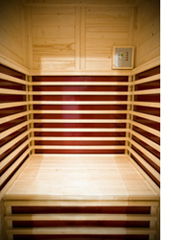 Infrared sauna technology has evolved a great deal since the old days I mentioned earlier, back when infrared sauna marketers so often twisted the benefits of near infrared vs. far infrared to suit the particular saunas they were selling. Sauna units called "full spectrum infrared saunas" are the new trend in this still-evolving industry, and you'll probably start seeing more and more sauna companies promoting them. Once again, however, the companies who sell full spectrum infrared saunas will use their promotional materials to tell you how much better those saunas are than any other type. This type of marketing behavior is probably something to be expected in light of human nature, but it can become a bit ridiculous. Just as an example of how bad it can get, some of the same companies that used to advise their customers to stay away from either far infrared heaters or near infrared heaters (whichever version was the type of infrared sauna they didn't sell) are now promoting full spectrum infrared saunas, which use both near infrared AND far infrared heaters - one of which they mightily castigated in the past. These same companies then take things from bad to worse by listing the specific health benefits their full spectrum infrared saunas can provide - with each specific benefit identified as being furnished by a particular portion of the infrared spectrum, either near, middle or far. Picture three columns, one captioned "near infrared," the second captioned "middle infrared," and the third captioned "far infrared," with the health benefits provided by each type of infrared listed beneath the appropriate column's heading. Seeing this occur might sadden you, because it damages the reputation of infrared saunas, the technology they use, and the infrared sauna industry overall. After all the twists and turns they've come up with in the name of promoting their products, who will be willing to believe anything that the infrared sauna companies are telling us? The truly sad thing about all of this is that infrared sauna therapy truly does offer a large number of health benefits. To the top of "full spectrum infrared sauna"